Your backyard should be an enjoyable retreat your entire household can appreciate. Who doesn’t love a round of putt putt? Adding a small, but well-planned-out course will bring joy to everyone. 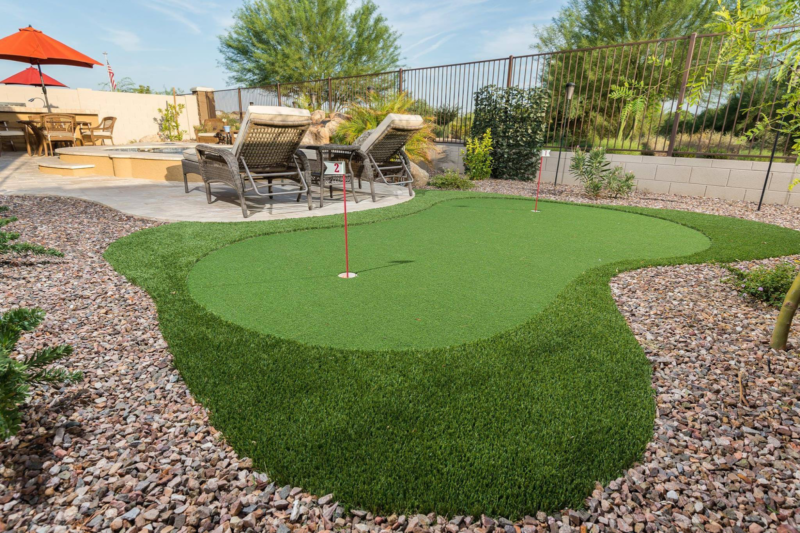 Have your landscaping professionals create a putting green with three holes and a whimsical backdrop. You can keep the flags, balls and other equipment stored neatly in a special golf gear display box in your yard. If you haven’t played H-O-R-S-E lately, then you’re missing out. Since basketball can be played solo (time to work on those free throws) or as a team sport, it’s the perfect solution for anyone who whines “I’m bored.” A poured foundation and surrounding landscaping will ensure that the fun stays near your half court while the rest of your yard remains free for other uses. Whether you want to add a couple hammocks, a pool or a treehouse, your landscaping team will ensure that everyone can enjoy the new backyard. Speaking of treehouses, kids love to pretend. You can have an area designed for them to act out their favorite stories or movies. Whether you opt for a magical playhouse, a pirate ship or some other type of building, don’t forget to include the accessories! Alternatively, you can create a secret nook with landscaping — just choose a special corner and surround it with flowers and shrubs for extra privacy. Add unique stepping stones for the path and covered seating for rainy afternoons. Fire up your grill, and try to match your cuisine to the theme of the movie you’ve chosen. Comfortable seating and the large screen make outside movie-watching an ideal summer activity for the whole family. Instead of focusing on one activity, provide your family with a range of choices. A tumble mat will give your kids a way to burn off excess energy and stay in shape, while oversized game boards can provide stimulation for mind and body. Use alternating squares of sod and pavers to create a checkers board. Switch the pieces out and you have a large game of chess. For the younger kids, provide hopscotch and a chalkboard. Adults will appreciate croquet and horseshoes. Use a playful decorative touch for the game storage building. You could even add games to the outside of the building, such as a dartboard or pin the tail on the donkey. Whether the adults make the decision on which route to go, or you have a family vote, you’ll all have fun transforming your backyard into an inviting place for the whole family to enjoy!